Having clawed their way back in the first cricket Test against Australia with a brilliant batting by the lower order batsmen, Rahul Dravid today said India had to remain positive as "anything could happen" on a track which is showing signs of deterioration. Dravid struck a fighting knock of 51 to revive India's fortunes before Harbhajan Singh and Zaheer Khan joined hands to rattle up an astonishing 80-run partnership for the eight wicket to bring the hosts back into the match. "Their (Harbhajan and Zaheer) partnership has given us a bit of hope. We know that wicket is not going to get easier as the game goes on. Still Australia has to bat third. I know they're tired at this stage. We still got to be positive. "We still got to keep believing. A lot can happen on this wicket. 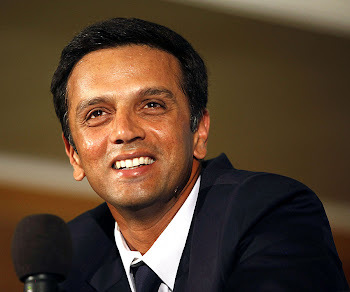 Anything can happen and I think we're very positive," Dravid told reporters at the post-match press conference. Dravid said the key for India lies in narrowing the lead and then taking early Aussie wickets. "We can get a few more runs tomorrow. Maybe put some pressure on them by taking some early wickets when they bat. Obviously we're behind a little bit, but not far behind that we cannot fight back. "We saw Clarke and White getting some turn. If our spinners can also do the same, two interesting days of cricket is left from here on," Dravid said. I just saw your blog 2day. Man how'd I miss it? I too am a Dravid fan and nice to see a blog dedicated to THE GREAT INDIAN WALL. I've added you in my blog as a link and could you (plz.) come and check my blog. plz and leave a comment. I'm also a great fan of Dravid. I've added you in my blog as a and could you (plz.) come and check my blog. plz and leave a comment.